Koshiyama Shingo sensei (graduate of Kokushikan University Aikido Club), spread Shodokan Aikido in Switzerland after being taught by Tomiki Kenji shihan. 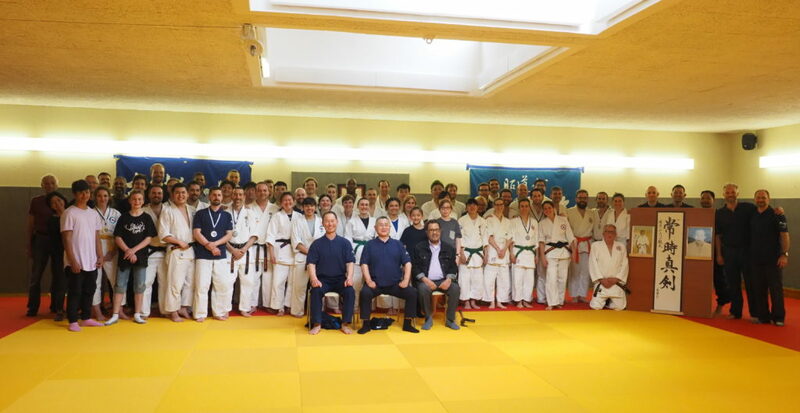 After Koshiyama sensei passed away 18 years ago, the Swiss members created the Koshiyama Cup in his memory as a commemorative event, the first of which was held in 2008. “The 4th Koshiyama Cup”, was attended by members from Switzerland, UK, Spain and other countries across Europe and was an extremely enjoyable event. There were also 10 participants from Japan, including Nariyama Tetsuro shihan, Yamagata Masaaki sensei, and Sakai Shinnosuke sensei. The following is a summary of the two day event. The first day of the Koshiyama Cup was an aikido competition, consisting of both kata embu and randori shiai. Embu was divided into two events: Non-dan grade division (Kihon Junanahon, 17 techniques) and Dan grade division (Koryu Goshin no Kata, from suwari waza to tachi waza 16 techniques). Tanto Randori Kyogi was divided into Men’s Individual and Women’s Individual events. For the Non-dan grade division, I felt there was a big difference in the level of the many participants. For example, there were several pairs that hadn’t quite remembered the full Junanahon. However thanks to the encouraging atmosphere, I think this was a good opportunity for everyone, including absolute beginners, to gain valuable competition experience. On the other hand, the Swiss pair that won, were very good indeed. In the Dan grade division, I felt that overall the level was very high. The level of not only tori’s techniques, but also uke’s level was very good, with many very precise and accurate demonstrations. Even with this said, Fumika Thorimbert sensei (formerly Fumika Yamasaki sensei) and her husband Loris’ winning embu was really a wonderful demonstration of Goshin no Kata, with a clear difference between this and the other high-level pairs. The winning pairs in both the Non-grade division and the Dan-grade division also put in excellent performances and secured medals in last year’s World Championships in England. Even the runners-up in the Dan grade division of this Koshiyama Cup were former Koryu Goshin no Kata World Champions. Therefore I think it is no mistake to say that the embu level of this Koshiyama Cup was the same as in the highest levels of the World Championships. In the tanto randori kyogi, everybody took part in the matches fairly and demonstrated respect and good sportsmanship. Regardless of the results of the matches, there was a good atmosphere which resulted in everyone building good relationships with each other. Before beginning the randori matches, there was an explanation of the rules given by Sakai sensei. This was attended by not only the competition’s referees, but also competitors of all levels, who listened attentively to Sakai sensei’s explanation. I felt that generally the standard of refereeing throughout the competition was quite high. Following the end of the competition, there was a party, which everybody enjoyed very much. On the second day was a series of seminars. Under Nariyama shihan’s instruction, there were three seminars across the day. Two of these seminars were aimed at general practitioners, with the final seminar aimed at dan grades and instructors only. However everybody who joined the seminars practiced very enthusiastically, allowing Nariyama shihan to respond by teaching high-level techniques even within the seminar for general practitioners. I felt that this was valuable instruction for all grades. Firstly, Nariyama shihan taught the difference between unsoku and taisabaki, and then progressed to 6 directional avoidance, as well as irimi and tsukuri practice. Nariyama shihan explained about correct kamae, natural posture, as well as the benefits of using hanmi during movement. Also Nariyama shihan stressed the importance of body movement throughout all the stages of the technique. Following this, we returned to kihon waza practice and practiced kihon atemi waza. Nariyama shihan explained not only the details of the technique, but also why each technique has its name, and also the weak points of the body that each atemi should be aiming for. Next, there was an explanation on the relationship between weapons principles and tegatana dosa. Nariyama shihan continued by teaching various application techniques of atemi waza. Nariyama shihan explained that when practicing weapons techniques, particularly techniques when you are using the weapons, suburi is very important in order to make real, or ‘living’ technique. This third seminar was aimed at black belts and instructors only, so there were already many people who knew these techniques, however in order to get closer to producing real technique, focus was placed on both bokuto and jo suburi. After sufficiently practicing these, everybody practiced eight yari no housaki ga kumitsukareta baai techniques, and eight kumi tachi techniques, again taken from Koryu Goshin no Kata. Finally, Nariyama shihan reminded everyone that after learning the practice method, continuing this practice everyday is very important. Over the two days, I was impressed by all of the European member’s enthusiasm as they took part in both the competition and the seminars. Everybody practiced well with each other, creating an excellent atmosphere, which lead to a very successful event. Finally, I felt that the Swiss hosts’ hospitality and warm welcome was truly wonderful. I am already looking forward to the next Koshiyama Cup.